Looking for bulk ammo for your pistol or rifle? 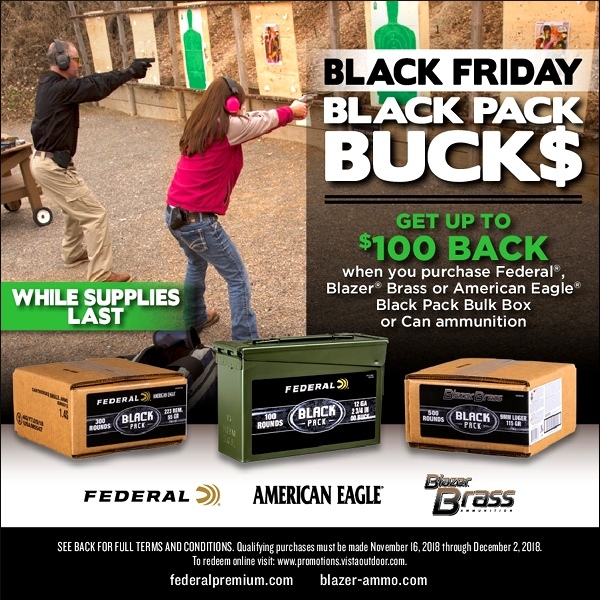 Right now Federal Ammunition is running a “Black Pack” promotion, just in time for the Black Friday/Cyber Monday Weekend. With this deal you get a direct Federal factory rebate up to $100.00 on Federal, Blazer Brass, or American Eagle Black Pack Ammo. The Rebate program is good through December 2, 2018. Combine this Factory Rebate with special Black Friday Weekend pricing from Brownells, and you can get reliable, brand-name USA-made ammo at bargain basement prices. NOTE: These aren’t everything!! There are also Black Pack Rebates for .22 LR, 9mm, .40 SW, 12 gauge shells, and other ammo types. Just look for for Federal, Blazer, and American Eagle with Black Labels! NOTE: If you purchase at least $200 before 11/25/2018 at 11:59 PM, you can get an additional $20 Off your order with Brownell’s Code FN2, or 10% Off your order over $300 with Code FN3! Remember though — this deal ends Sunday 11/25 at midnight! Purchase ONE (1) case of Federal, Blazer® Brass or American Eagle® BLACK PACK bulk case or can ammunition and receive $20 back. Limited to FIVE (5) cases/cans or $100 per household. Valid manufacturer product numbers limited to: 5202BF350, 5200BF500, 5220BF350, 5230BF300, AE223BF300, 788BF and BF127 00AC1. Product must be purchased between 11/16/2018 through 12/2/2018. DEADLINE for mail-in or online submission 1/2/2019. See Terms and Conditions. Share the post "Get Rebate Up to $100 on Federal Ammunition"
I just bought 1000 rounds of 9mm federal ammo from Targetmaster gun range in Chadds ford PA, they’re still displaying the rebate but this website says it must be post marked by 1/2/19! It’s only $20 bucks but it’s the point! It’s false advertising! I’m not real happy. I advise you to contact them to take down this type of advertising! Received on 3 Dec 18 to El Paso was 100$ worth of rebates. Correct documentation was sent. Contacted company 3 weeks ago. No reply. Have pics and postal proof. Will give it a week or two more, then this goes to the state AG office. Last year, after one contact, received my rebate within a week. Over two months currently with this one. I purchased 1 box of 300 rounds of 223 rem. 55 gr from Academy Sports & Outdoors on Nov.20,2018. I also purchased (on a separate rebate) 1 box of 9mm 500 & 2 boxes of 380ACP 350 rounds each. All required documentation was sent in on Nov.21 (sent to Federal Promotions Offer #1203-81 PO Box 750643 ElPaso, Tx) & Nov. 23 (Federal Black Friday PO Box 4009 Promo #R9835 Grand Rapids, Mn). I have copies of all info that was sent in. As of this date Feb.13,2019 we have not received any rebate. 2 boxes of 22cal 5962528 1 box 223cal 5962524 it was sent in 11-2018 come on now not hearing good things about the rebates were mine sent in every thing. Purchased on Nov. 19,2018 at Academy Sports in Midland, Tx. 3 boxes, 1 45cal, 1 9mm, and 1 22Lr. Tried to check the stats today and says no code found. Cannot find a phone#. We have copies of everything. was Mailed before the end of Nov. 2018. Is this a scam? I received my rebate for $20 on a mastercard rewards card. have not received my rebate yet as of today. don’t even know how to check it. Purchased 5 boxes of ammo last November on Black Friday. Have not heard anything from Federal. I sent in all of the correct paperwork. Very disappointed customer. Rebate form said to allow twelve weeks for rebate to arrive. I sent mine in on 28 November 2018 it’s now 12 March 2019 about fifteen weeks, no rebate. Boycott Federal ammo Sportsman’s Warehouse sent me another flyer in the mail today offering a rebate on Federal ammo, I won’t be taken again! Buyer beware! i bought 4 boxes of federal .22 ammo on 11-18-18. sent all docs as requested. it is now 3-2219, no rebate yet. will not buy federal or academy sports. if academy will partner with companies like federal, what won’t they do ? Still waiting for my rebate, does anyone have a good system to contact vista outdoors for a status check?? ?